The men were part of a gang who robbed a store earlier this year. Joshua Jordan and Sadik Kamara. TWO LONDON MEN have been jailed for a combined 28 years after two attacks on two women in a crime spree earlier this year. Joshua Jordan and Sadik Kamara were today sentenced to 14 years each for the March attacks that were committed as part of a gang robbery. 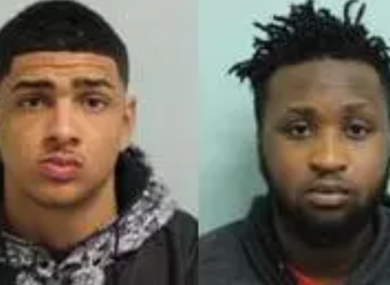 The court had heard that Kamara, who is a well established rap artist under the name ‘Trizzy Trapz’, and Jordan travelled from Newham to Hackney to commit the robberies on Friday 10 March. In the first attack, the pair were part of a gang of five that targeted a supermarket after staking it out for the evening. A woman in her 50s was the lone shopkeeper in the store when they entered. “In a carefully planned attack with a getaway car and a lookout waiting nearby, four of the attackers entered the store wearing gloves and masks,” Met Police said today. None of the robbers made any demands or gave the victim a chance to respond before Kamara squirted high strength ammonia in the face of the victim several times burning her. After the gang sped off in the getaway vehicle the drove past their next victim, another woman in her 50s who had been walking to a friend’s house after getting out of a taxi. Two members of the gang forced the woman to the floor and one pinned her face to the pavement while the other repeatedly sprayed the woman in the face with a fresh bottle of ammonia. As with the first attack, it was only after the victim was burned by the cleaning liquid and lying injured that attempts were made to steal from her. The pair stole her handbag and ran back towards the car. A witness saw the pair laughing amongst themselves as they ran away from the burnt victim on the floor. Both victims were rushed to hospital with facial burn injuries, one suffering chemical burns to her mouth. Due to the quick treatment they received, neither victim has been left permanently disfigured but the shopkeeper has now been forced to give up working in the supermarket. Jordan and Kamara were subsequently identified and arrested and paperwork found at Kamara’s home indicated he sought hospital treatment the day after the robbery for exposure to ammonia. Both men were convicted of harm relating to the use of at the ammonia as well as robbery. “The behaviour of both Kamara and Jordan was cowardly in the extreme. Five physically strong males preying on lone, slightly-built women to attack and rob,” Detective Constable Ben Kahane said today after the sentence. Email “Two London men who sprayed corrosive fluid in the face of two women get 28 years in jail”. Feedback on “Two London men who sprayed corrosive fluid in the face of two women get 28 years in jail”.